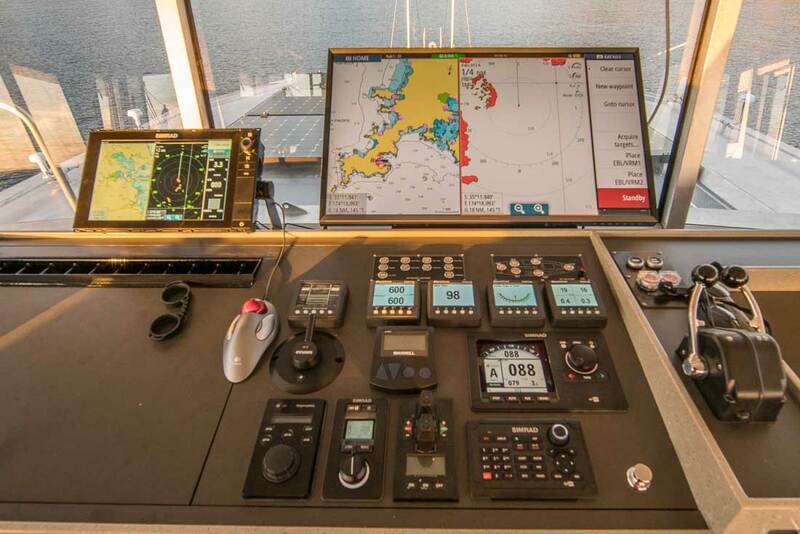 SetSail FPB » Blog Archive » Simrad Marine Electronics: The Correct Choice – Or Did We Make A Mistake? This is the first time we have personally used an integrated electronics package–in this case including radar, autopilot, chart plotter, depth sounder and forward looking sonar, AIS, VHF, and side scan sonar. In the past we have chosen what we felt was the best radar (usually Furuno), autopilot (mostly WH), radios (typically Icom), and chart plotter (most recently Rose Point). This time we went with Simrad for several reasons. They had a robust and stable software platform, the charting system accepted a wide variety of different manufacturers’ charts, we were very impressed with the 4G radar and assumed (wrongly as it has turned out) that the Halo would be a breakthrough in target definition due to its much larger antenna. We also liked the apparent ease of operation, and there were theoretical benefits cost-wise to the installation of an integrated system. We were concerned with the autopilot being able to handle our big rudders in heavy weather without oversteering, and did not give much credence to the “Go Free” wireless app. First the good news. The platform is indeed stable. We have not had a system lockup. The AP70 pilot is superb. There are a variety of work modes that are easily programmed and switched between, and the turn and track functions work very well. We really like this autopilot. Our only complaint is that sea state, or dead-band as it is sometimes called, is not easily changed and is global rather than being adjustable for each work mode. The forward looking and side scan sonars are useful and very modest in cost compared to a proper searchlight sonar (but of course have nowhere near a searchlight sonar’s capability). The list of comments that follow were compiled by both Steve Parsons and this writer. Between us we have in excess of half a million sea miles of experience using radar, along with a fair amount of paper and electronic charting time as well. While it is entirely possible we have some installation or operator issues impacting our Simrad performance, we have been unsuccessful in getting a response from anyone at the company towards educating us – or checking out our systems – which in itself, of course, sends a message. Since SetSailors know we are using this gear, there is an implied endorsement if we don’t mention the negatives. There is not much difference between a solid red return, and upon fine-tuning the return diminishes to nothing. This is the case despite careful fine-tuning with gain and clutter. So it is harder to differentiate between e.g. a rain squall and a legitimate target compared with other radar displays, which have a clearer visual graduation of target density, i.e. gradual color change red-yellow-green-blue. Experientially this is more than just a sensitivity adjustment issue–even worse when gain, etc are set to auto. You have to set EBL/VRM points before going into the menu to bring them up–not user friendly, especially for accuracy. Separate adjustments for each of the EBL/VRMs would be more useful, e.g. for setting up transits on anchor watch. The range rings become impossible to discern when in night mode. Sometimes radar setting adjustments (gain, rain and sea clutter) don’t get applied even though the values change on screen–you have to put the radar into standby, then transmit again. Targets can appear blotchy even with target magnification reduced. This is not helpful when making out the lay of a reef/pass. There is no way to position the radar within the ship envelope, so using the radar for precision anchoring is not practical. Actual distance measurements within 100 meters are way off. There appears to be no method of saving MARPA and AIS tracks. When plotting/editing a route, there are many superfluous mouse clicks. It could be more user-friendly. There is no ‘fly-over’ mode after saving a route- this option is invaluable as a means of finding plotting errors. Also useful would be a warning when a route being plotted extends beyond the purchased chart area. In the list of saved routes there is no column for total distance for each route. The vessel track sometimes stops recording and needs to be re-started. This is not an issue of available memory. Would it be possible to have navigational hazards displayed when in a range greater than 5 nm? This should be a user decision. This is relatively common with smaller recreational units, but the MARPA values are unreliable- the recorded tracks of MARPA vessels would be safer. The AIS settings are difficult to adjust, e.g. range at which AIS targets appear. The Simrad manuals are vague and not much use when attempting to diagnose a settings issue. They seem to be more of a general overview than effective user manuals. We are hopeful that there will be a software upgrade that corrects these issues, or we will find a glitch somewhere, but if not, we will eventually have to replace the Halo radar. Based on this experience the owner of FPB 78-3 has decided to go with Furuno gear. This entry was posted on Friday, February 24th, 2017 at 1:55 pm and is filed under Cruiser's Tech Talk, Dashew Logs, FPB 78, The Logs. Both comments and pings are currently closed. Well there is something you hardly see these days…an honest review, warts and all. Thanks Steve. I just scratched Simrad off of my vendor list. Thank you Steve and also a big thank you to Kurt.